Rahnedjat, A., Rabiei, M., Doyavi, V., Shahmiri, H. (2017). Development and Investigation of a Cognitive-Metacognitive Behavioral Model: An Explanation for Hypochondria Disorder. International Journal of Behavioral Sciences, 11(2), 55-60. Amir Mohsen Rahnedjat; Mehdi Rabiei; Vahid Doyavi; Hasan Shahmiri. "Development and Investigation of a Cognitive-Metacognitive Behavioral Model: An Explanation for Hypochondria Disorder". 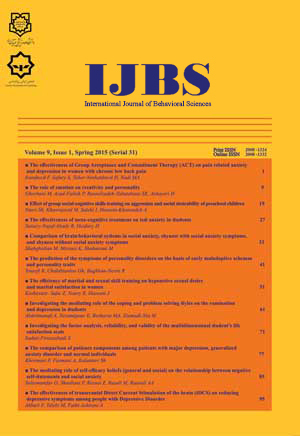 International Journal of Behavioral Sciences, 11, 2, 2017, 55-60. Rahnedjat, A., Rabiei, M., Doyavi, V., Shahmiri, H. (2017). 'Development and Investigation of a Cognitive-Metacognitive Behavioral Model: An Explanation for Hypochondria Disorder', International Journal of Behavioral Sciences, 11(2), pp. 55-60. Rahnedjat, A., Rabiei, M., Doyavi, V., Shahmiri, H. Development and Investigation of a Cognitive-Metacognitive Behavioral Model: An Explanation for Hypochondria Disorder. International Journal of Behavioral Sciences, 2017; 11(2): 55-60. 1Department of Clinical Psychology, AJA University of Medical Science, Tehran, Iran. Introduction: Hypochondria is a prevalent disorder which is resistant to diagnosis and treatment. The present study has aimed to develop and validate a new behavioral cognitive-metacognitive model, which explains the hypochondria disorder.Methods: The present research used a descriptive and correlational research method with a structural equations design. In the current study, a comprehensive and detailed definition of hypochondria disorder was suggested and then the conceptual model was proposed. Finally, the model developed with the help of structural equations was tested through the AMOS Graphic software.Results: Results of the structural equation model indicated that the behavioral cognitive-metacognitive model is capable of explaining the hypochondria disorder. Moreover, the results of the general fit indexes of the structural equations model suggested that the developed model has the goodness of fit indexes with the sample data and is closely related with theoretical hypotheses.Conclusion: The suggested model in this study had multidimensional focuses on all behavioral-cognitive and metacognitive aspects. Furthermore, the model considered all the three dimensions to be in an interacting relationship (it did not consider them to be separate or conflicting concepts).Therefore, it was considered to be a novel explanatory model. This model might promote future researches regarding hypochondriac disorder and facilitate case formulations and relevant clinical treatments. - American Psychiatric Association. Diagnostic and Statistical Manual of Mental Disorders (4th Edition) Text Revision. Washington DC: Author2000. - Sadock BJ, Sadock VA. Comprehensive Textbook of Psychiatry; 8th ed. Lippincott, Williams and Wilkins 2005: 1810. - Marcus DK, Gurley JR, Marchi MM, Bauer C. Cognitive and perceptual variables in hypochondriasis and health anxiety: a systematic review. Clin Psychol Rev 2007 Mar;27(2):127-39. - Creed F. Should general psychiatry ignore somatization and hypochondriasis? World Psychiatry 2006 Oct;5(3):146-50. - Hiller W, Leibbrand R, Rief W, Fichter MM. Predictors of course and outcome in hypochondriasis after cognitive-behavioral treatment. Psychother Psychosom 2002 Nov;71(6):318-25. - Noyes R, Jr., Stuart SP, Langbehn DR, Happel RL, Longley SL, Muller BA, et al. Test of an interpersonal model of hypochondriasis. Psychosom Med 2003 Mar;65(2):292-300. - Creed F, Barsky A. A systematic review of the epidemiology of somatization disorder and hypochondriasis. J Psychosom Res 2004 Apr;56(4):391-408. - Clark D, Beck A. cognitive therapy of anxiety disorders. THE GUILFORD PRESS, New York London 2010. - Beck AT. Cognitive therapy and the emotional disorders. New York: International Universities Press1976. - Purdon C, & Clark DA. Obsessive intrusive thoughts in nonclinical subjects. Part I. Content and relation with depressive, anxious and obsessional symptoms. Behavior Research and Therapy1993, 31, 713â720. - Ker linger F N, & Lee HB. Foundations of behavioral research (4thed.). Holt, NY: Harcourt College Publishers 2000. - SALKOVSKIS PM, RIMES KA, WARWICK, HMC, and CLARK, DM.(2002). The Health Anxiety Inventory: development and validation of scales for the measurement of health anxiety and hypochondriasis. Psychological Medicine, 2002, 32, 843-853. - Rabiei M. Development of a causal behavioral-cognitive-metacognitive model for explaining the class of obsessive-compulsive disorders and the effect of intervention based on the model on severity of the symptoms of obsessive-compulsive disorders. Ph.D Thesis, University of Isfahan2013. - Briere J. The cognitive distortion scale professional manual. Odessa, FL: Psychological Assessment Resources 2000. - Weismann AN, & Beck AT. Development and validation of the dysfunctional attitude scale: A preliminary investigation. Paper presented at the Annual Meeting of the American Educational Research Association, Toronto, Ontario 1978. - Holon SD, & Kendall PC. Cognitive self-statements in depression: Development of an Automatic Thoughts Questionnaire. Cognitive Therapy and Research1980, 4, 383-395. - Ghasemzadeh H, Mojtabaei R, Karamghadiri N, Ebrahimkhani N. Psychometric properties of a Persian-language version of the Beck Depression Inventory--Second edition: BDI-II-PERSIAN. Depression and anxiety2005; 21(4):185-92. - Cartwright-Hatton S, Mather A, Illingworth V, Brocki J, HarringtonR, & Wells A. Development and preliminary validation of the Meta-cognitions QuestionnaireâAdolescent version. Journal of Anxiety Disorders2004, 18, 411â422. - Wells A. Metacognitive therapy for anxiety and depression. New York: Guilford Press 2009. - Wells A, & King P. Metacognitive therapy for generalize anxiety disorder: an open trail. Journal of Behavior Therapy and Experimental Psychiatry2006, 37, 206-212. - Rabiei M, MT. Goldoz-Khayat, N. The effectiveness of metacognitive-cognitive-behavioral intervention on severity of the symptoms of hair pulling disorder Journal of Behavioral Sciences. 2014;7(4):8-373,(persain). - Rabiei M, Salahian A, Bahrami F, Palahang H. Construction and Standardization of the Body Dysmorphic Metacognition Questionnaire J Mazandaran Univ Med Sci 2011;21(83):43-52,(persain).